The best bit in Neil Jordan's quasi-hagiographic Michael Collins is the final scene: a black and white coda featuring archival footage of the real Collins' funeral. This is, sadly, one of the rare moments when the film really hits its stride: what with the transcendental, thrusting bombastery underlain with leaping violins... well, it's all very transcendental, mystical and Neil Jordany. That is, bordering on the fantastical, while still deeply relevant to gritty reality. Is that a PPCC tear? Yes. Yes, it is. Unfortunately, the rest of the film isn't quite so consistent. Director Jordan traffics in a very special, wonderful kind of weirdness: his films often feature gender-bending sexuality, coupled with Irish Troubles and a dash of the surreal. 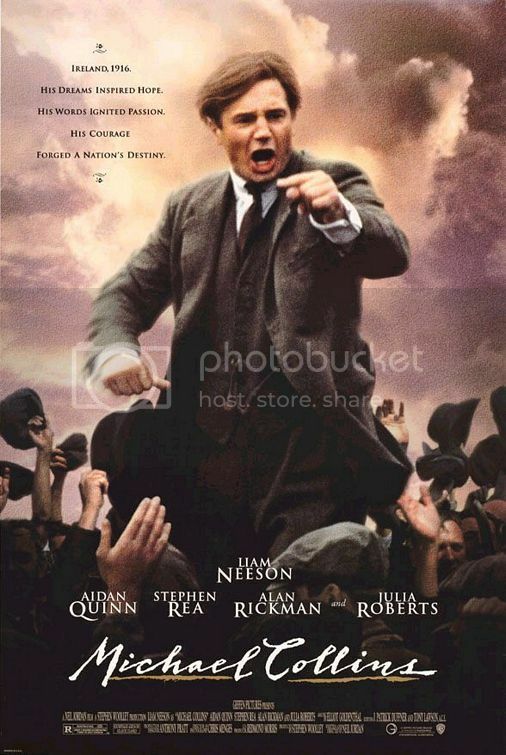 In Michael Collins, Jordan tones it down - or tries to, anyway - in telling a relatively straightforward biography of early freedom fighter, "Minister of General Mayhem" Michael Collins (played by a vivacious Liam Neeson). The problem is, we think, that Jordan can't quite keep his natural tendency to weirdness in place, and so the film is a jagged mess of episodic, clunky narrative and awkward shifts in tone. One moment, we're in a giggling, carefree love triangle between Michael, his best friend Harry Boland (Aidan Quinn), and the one-dimensional "Irish rose" Kitty (Julia Roberts, in an accent that comes and goes). The next moment, Michael is instructing his foot soldiers on which arsenals to set fire to, and which British collaborators to shoot in the head. It's all a bit jarring, and it never quite comes together. The film begins with the 1916 Easter Rising, and we're quickly introduced to Michael, Harry and the whole band of Irish Republicans. The most notable of which is Eamon De Valera (Alan Rickman, not really doing the accent), President of the Irish Republic and a character who appears and disappears to America and then appears again, only to ruin everything by complaining too loudly about the Irish Free State. Okay, maybe Ebert was right and this movie isn't terribly balanced (or even informative) regarding the bloodshed that followed the Anglo-Irish Treaty. The relatively ignorant PPCC certainly didn't exactly follow why De Valera was in such a stitch. And that sort of undermines the tragedy of it all. Trying to make the love triangle become a parallel for these state-level schisms also just felt... weird. Furthermore, we lost a bit of faith in this film's balance since Michael Collins, as played by Neeson, seemed so superheroic, so larger than life. He has brio and panache and a kind of Gerard Depardieu-as-Porthos joie de vivre. Everyone worships him, Kitty goes glassy-eyed when she sees him, and he seems ballsy and noble and true. That's fine. Okay. But what was he really like? Moments of a rounded personality, or even just a dash of doubt, would have been more effective in fleshing Collins' out. Especially since his work, being so violent, carries a sinister quality - some darkness, or at least more seriousness (! ), would have been merited. As it stands, the film is diverting, but almost cartoonish. When comparing it to Ken Loach's stern, stately The Wind That Shakes the Barley (a film about the same period), it inevitably comes up short. Sorry, Mr. Jordan! We love you, otherwise!